Pig-Pen is one of the most well-known characters in Charles Schulz’s Peanuts comic strip. This overall-clad kid was always depicted as a disheveled dust magnet. Once when Pig-Pen was caught in a rainstorm, he lamented that “in one minute the rain has washed away what took me all day to accomplish.” Charlie Brown, the only character to unconditionally befriend Pig-Pen, had a more philosophical view about the filth that covered his friend. In one strip, Charlie Brown said, “Don’t think of it as dust. Just think of it as the dirt and dust of far-off lands blowing over here and settling on “Pig-Pen!” It staggers the imagination! He may be carrying the soil that was trod upon by Solomon or Nebuchadnezzar or Genghis Khan!” I love that. We all need a friend like Charlie Brown. 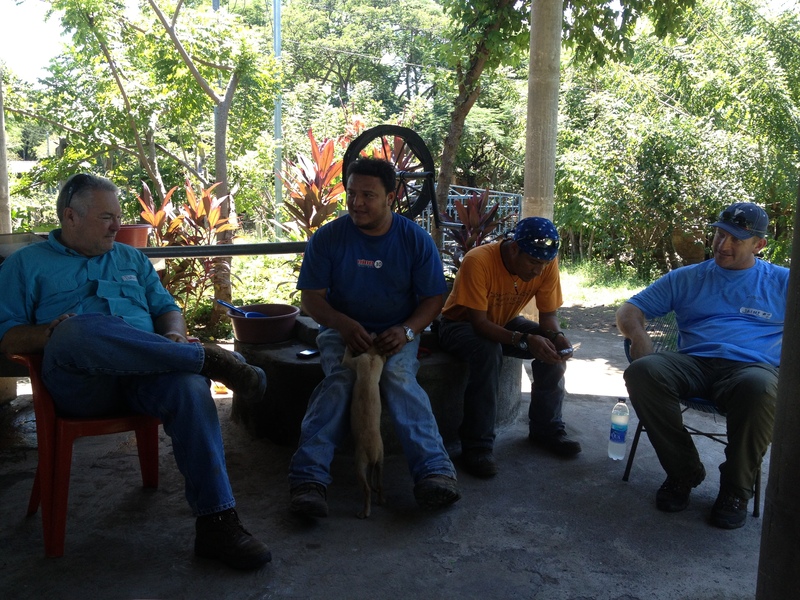 Pig-Pen was much in my thoughts today as our team started drilling a water well in the village of Tonalá. We are drilling with compressed air, a process that stirs up unbelievable clouds of dust that hover and then cover everything in sight. It did not take long for us to feel Pig-Penesque. However, when we drilled through the first aquifer, clouds of dust became showers of mud. For the person operating the controls on the drilling rig, there is no escape. You will get dirty — very dirty. Once the dust and the mud have covered your clothing, they will find their way inside your clothing. 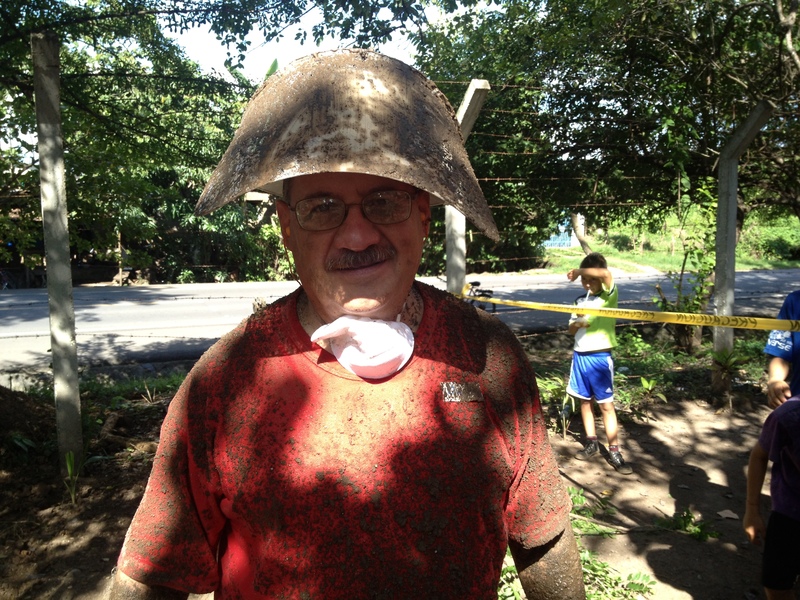 When I finished my turn at the controls, the face shield on my hard hat was so covered with mud that I could no longer see. But, that’s ok. This is one of the parts of drilling that I like because it’s a sign of making progress. 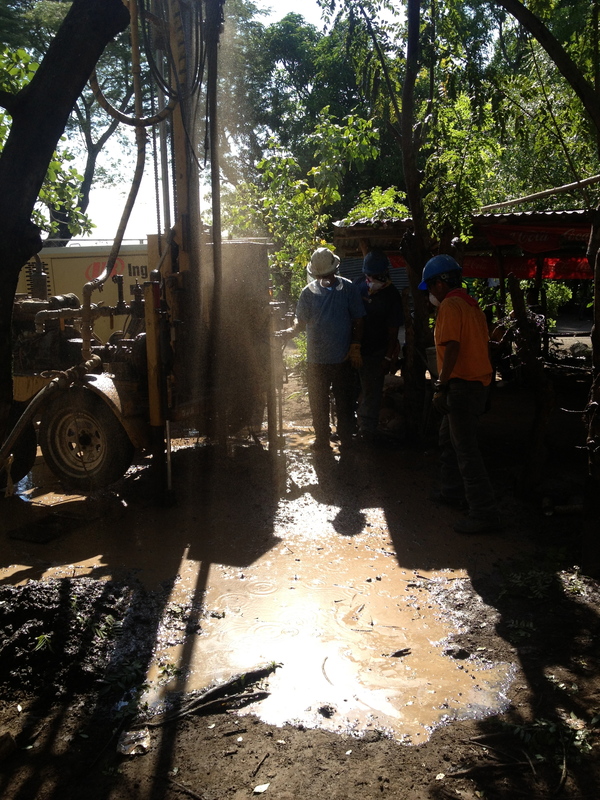 Drilling a water well is just plain messy. There is no way to drill and to stay clean. Sooner or later, everyone involved in the process gets covered in dirt, grime, and mud. Today, one by one, our team members got dirty for God. It was not a matter of if but when it would happen. And when it did, no one complained. We understand that some things will not happen unless we are willing to get dirty. In a few more days we will present the people of Tonalá with a clean and reliable source of water — a gift that will mean better health and less time walking long distances to fetch water. Just thinking about the joy of that day makes getting dirty for God worth it all. We really don’t mind the mess or the mud. At the end of the day we had drilled to a depth of 90-feet. Tomorrow we will get dirty all over again as we drill a little deeper. Waiting for lunch before we start drilling. 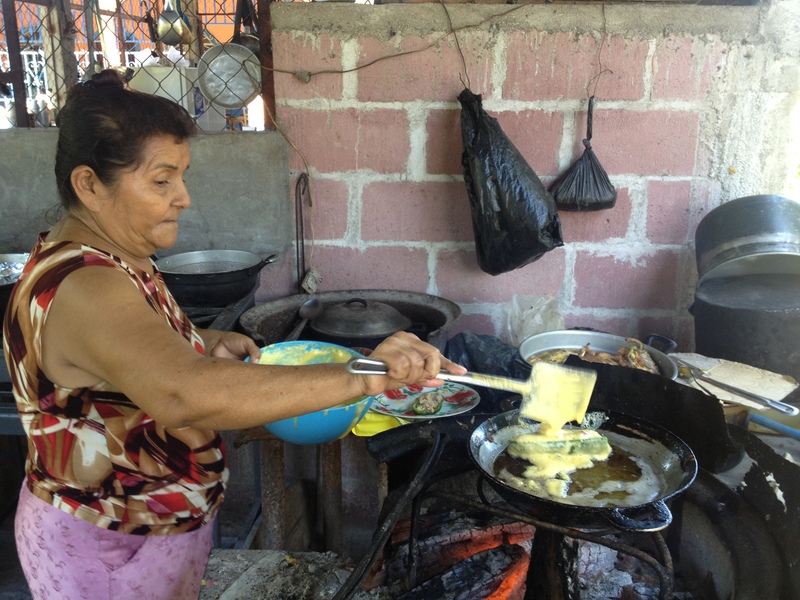 Fidelia, a village woman, preparing our lunch of chili rellenos and rice. Team member Jim Dry takes his turn as driller. 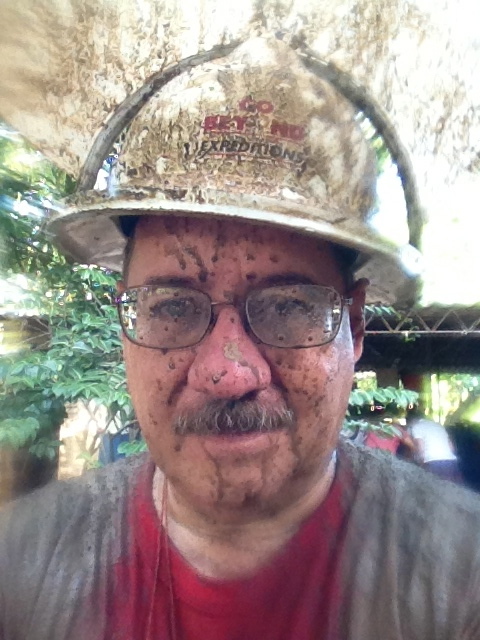 There is no way to stay clean when drilling a water well. Wish you were here, Dacques. Wishing we were there with you, Omar. Our prayers for successful drilling, completion of the well, and the legacy of Jesus, the true Living Water are with you. I think I see Stanley in your picture! Please give our love to the team. Dios les bendiga! Thanks, Jill. I will pass along your greetings to Carlos, Stanley, and the gang. Wish we had Team Burnside with us on site! What a blessing it is to read the blog for the bedtime story tonight to Parker & Grace. Thank you so much for taking the time to write the story! So glad Jim is with y’all!! He sent me a picture of the school room–do you know how bad I wish I could teach there!! 😊. Praying like crazy for y’all!! Hugs!! Thanks for your prayers, Kristin. The school next to our drill site is nice by El Salvadoran standards and filled with beautiful kids. You would love it here! Awesome! Looks like you’re having fun! Praise God! Lot of energy! Lot of fun! Looks good! We are having a great time together as we drill this well. I am very grateful for such a good and hard working team. Thanks. Miss you too, Gina. See you soon.